OK seriously? What did you do… Pitstop at the Spa for an afternoon of beauty with facial and massage? You are positvely glowing. I am so glad you are home. Yes its the great emailer in the world. 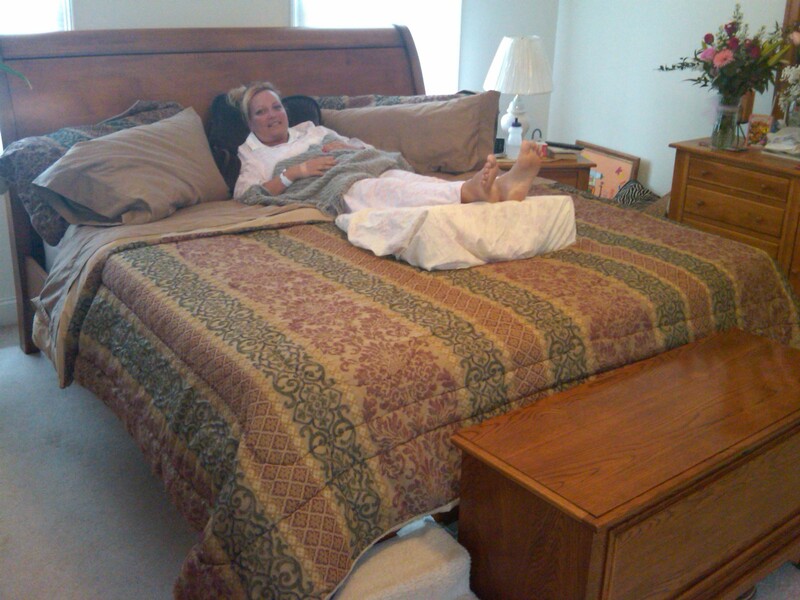 great to see that smiling face and you sitting back on that bed like a princess should. Ive just been thinking about when we were all sitting around the pool in Aussie and having the usual laughes about everything. I’ll have to get the yard cleaned up and pool ready for when you all come across for a visit. We are all with you and love you a lot. yes I do rememeber when we were in Boston and got caught in the car park ha ha. Good night. I will talk to you soon. Glad that you are home! Home is the place where the healing really begins! Take care of yourself though we’re sure Bruce will make sure of that!! Speak to you soon! P.S. Where are you hiding that bottle of Champagne? Sue good to see your smile no doubt due to your loving in-home nursing care.